And so begins Castle Hill Players 2019 season at the Pavilion Theatre with Bloody Murder by Ed Sala. At the estate of the esteemed Lady Somerset, a group of murder-mystery types gather for a weekend retreat. Do they know why they are all there? Of course not! 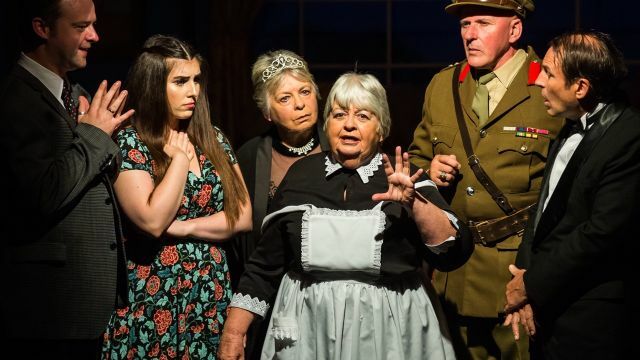 There’s the Major who served in India; the inebriated, fading actor; the innocent ingénue; the exotic woman in red; the mysterious Chinese gentleman; the rich dowager aunt and her faithful maid and the completely worthless nephew. Then, suddenly, the usual happens – someone dies! Who is next? Who is the killer? To make matters worse, her Ladyship wants no police – she refuses to go through all this again! Ahhh...all what again? 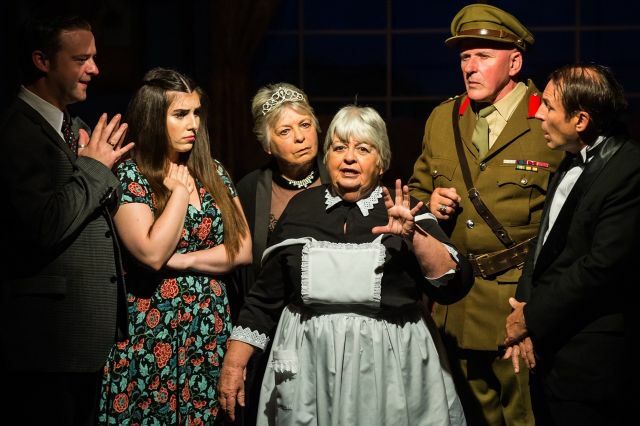 The tradition in theatre of a drawing room murder mystery is a long one, completely mastered by Agatha Christie and carried on by many others since. Doing comedy versions of these staple theatricals is also a tradition, so much so that we all can usually work out where the next laugh is coming from. Both draw on well-known clichés from horror stories, murder mystery novels and slapstick or romantic comedies. Ed Sala, however, decided to turn both traditions on their heads. Instead of characters completely oblivious to the dire plot, we have the usual suspects deciding to turn the tables on the author. No more will they allow murders to “ruin the party” or police to ask a lot of “rude, insinuating questions” whilst “trampling about in flowerbeds.” These characters are determined to not wander off alone and allow themselves to be picked off one by one, instead, they plan to work out who the true murderer really is – the author! Directed by Bernard Teuben Bloody Murder features a cast including Aurel Vasilescu, Larry Murphy, Brittany Macchetta, Ben Freeman, Sandy Velini, Marilyn Parsons and Jodie Klopf. Bernard Teuben not only directs, but has designed the set and sound. He is assisted by lighting designer Sean Churchward. Costume design is by Annette Snars. Bloody Murder runs from the 8th February until the 2nd March, 2019. The Pavilion Theatre is located within the Castle Hill Showground, entrance is at the lights located between Gilbert and Carrington Roads, Castle Hill.